We know a certain amount about Round Table – some is conjecture and deduction, and some is confirmed. Round Table’s history probably starts in around 1690, when a relatively simple rectangular building was constructed. This would have had rough stone walls, rendered with lime mortar. It would have had an earth floor, a simple “A” frame roof, and no distinct upstairs. Sometime in the eighteenth century, probably as the country was becoming increasingly prosperous, it was decided to build a proper upstairs. The “A” frame would have been dismantled, and the roof trusses re-used as floor beams. Two of roof beams in the main downstairs room are probably parts of the original “A” frame, and the roof beams visible upstairs may also be reused timbers. The walls would have been extended upwards, and a new roof added. Original – or at least early – roof beams are still visible in the loft. Around this time the massive chimney stack would have been built. Of course, having an upstairs also meant a staircase was needed, and the classic solution in Cumbria was to add a simple set of stairs half way along the longer wall of the building. And that is exactly where our staircase is. At Round Table, a little unusually, the then owner added an extension as well as the staircase. This is now the kitchen and smaller double bedroom. 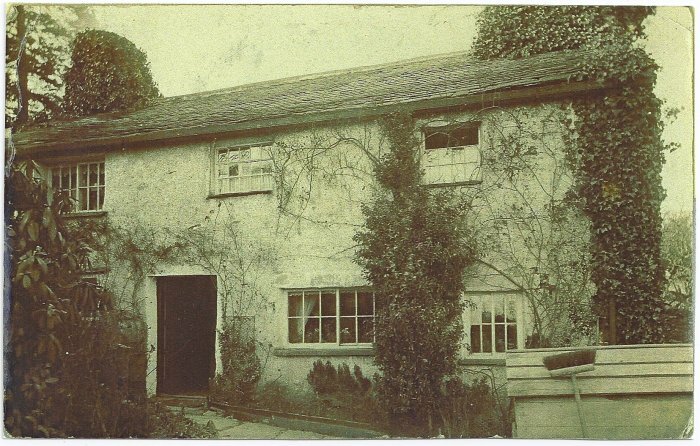 There is an unsubstantiated story that the cottage was a pub for a while and that maybe this is where the name came from. It’s possible since the lane comes right past, and continues up over Claife to Ambleside. But we really don’t know. 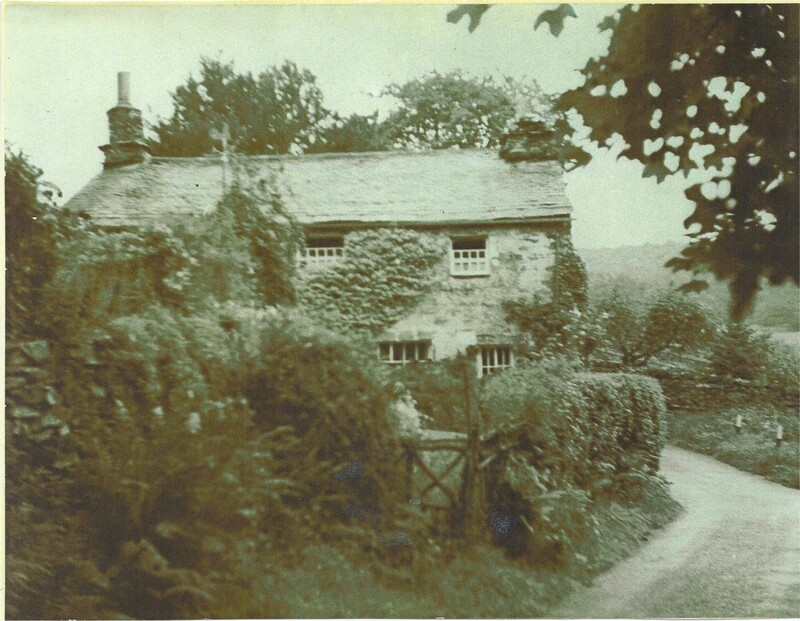 By the late nineteenth century, the cottage was owned by the Curwen family of Belle Isle. Their tenants were the Coward family, and in the garden are still their initials carved on a stone. These two photos were given to me by Al Balding who lived at Round Table during the war. We know that at least one Italian prisoner of war from Grizedale Hall worked in Round Table’s garden during the second world war. The now rather decayed sundial pedestal was cast by this man. We also know that what is now the kitchen was used at the parlour – the room only be to used on Sundays or formal occasions. 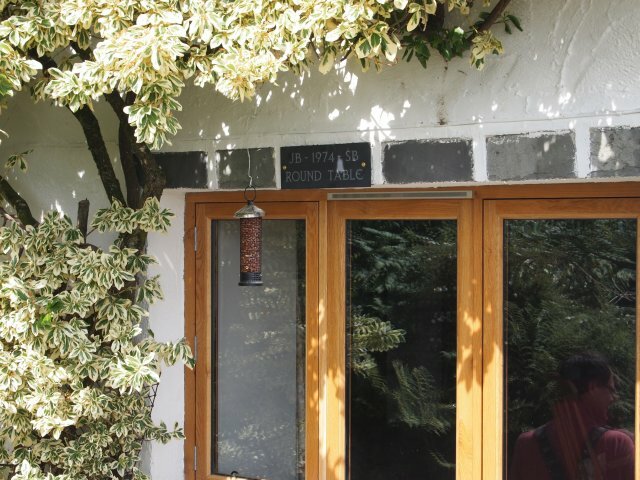 In around 1950 Round Table was bought by Les Worthington who carried out repairs and alterations, including the construction of the old single storey garage. The information which follows is the story my parents were told when they bought the house. How much is true and how much is apocryphal may never be known. The story says that Les lowered the floor level in the sitting room in order to gain a minimum height required for a grant from the council. Apparently everything went well until he hit rock roughly where the dining table is. At this point a building firm was called in since the whole structure was becoming quite wobbly. In around 1960 Round Table was sold to a Mr Sutton. Before or after this time most of Round Table’s land was sold, in various lumps, latterly by a Mr Stubbs. It had had 18 acres, including all the land behind the house and down to the south on which Satter Knotts and Brant Howe are now built. It also had much of the land between the house and the lakeshore. James and Sylvia Beney bought Round Table from Roy Wilson in 1974 and it has been in our family ever since. My father died in 1990 and my mother thirteen years later in 2003. Round Table’s story since then, including the 2011 – 14 building project continues on the next page..